Doctors' union the British Medical Association (BMA) and politicians alike have called for an opt-out system to be adopted in England, where people's consent to donate their organs after their death is presumed unless they have explicitly said otherwise. 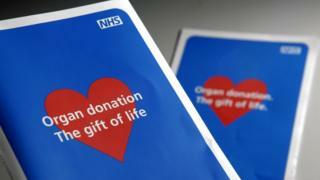 In a recent Parliamentary debate on organ donation, Labour MP Dan Jarvis said: "England must now move to an opt-out system. The evidence is clear - hundreds of people a year are paying a price of us not doing so." This is not to say the opt-out scheme is having a negative effect - some fluctuation is to be expected - but so far, despite the claims, we don't have any evidence that it is having a positive effect. As it currently stands, 6% of the Welsh population has opted out of organ donation. This is a group of people who in an opt-in system were still potential donors, depending on their families' wishes - they may not have ended up donating organs, but we just don't know. So-called "presumed consent" legislation was passed in 1979 but donor rates only began to go up 10 years later when a new national transplant organisation was founded which co-ordinates the whole donation and transplantation process. However, opt-out schemes don't always translate to increased organ donor rates. In Sweden, for example, such a scheme has been in force since 1996 and it remains one of the lowest-ranked countries for organ donation in Europe. Luxembourg and Bulgaria also have opt-out systems and low rates of organ donation. In France and Brazil, variations on a "presumed consent" system actually led to a decline in the rate of organ donation. Another difficulty in assessing whether opt-in or opt-out schemes are driving different countries' donation rates is that these schemes take different forms across the globe. In both Spain and Wales, families of potential organ donors are always given the chance to refuse. But this is not universal - Austria and Singapore both have "hard opt-out" systems where those who have not opted out are presumed to have consented to organ donation regardless of their families' wishes. And there are other differences, for example in Israel a priority incentive scheme means those who have agreed to donate their own or a deceased family member's organs are given priority on transplant lists should they themselves need an organ in the future. In "hard opt-out" systems there were increases in the organ donor rate of up to 25%.